There's been a lot of ranting on the Internet of late about Al Gore winning the Nobel Peace Prize. I'm not going to enter that debate; but it does seem like a good time to tell you about the first person to receive the symbol of Nobel's legacy. When you take into consideration the fact that Henri Dunant was born in Geneva in 1828, it is no surprise that he grew up to be a committed Calvinist. His father, a wealthy businessman, was also a dedicated humanitarian and Henri followed his father's example when he became a full time representative of the Swiss arm of the Young Men's Christian Association traveling throughout France, Belgium, and Holland. At the age of twenty-six he began an apprenticeship with a company that had extensive holdings in northern Africa. When he finished his apprenticeship he conceived of a daring plan to develop agricultural operations on a huge tract of African land, but for his plan to succeed he needed a wheat mill and to build and operate a wheat mill he needed the water rights. Those water rights could only be obtained from one person - Napoleon III. Seems simple enough except that Napoleon III was in Northern Italy leading a Franco-Sardinian army in a war against the Austrians. But this did not deter Henri, he sought the audience anyway, and that is how he ended up being at the battle of Solferino, in Lombardy, in June of 1859. Henri, like most people, had never seen a real battle before. He was stunned by the sight of 38,000 injured, dying and dead soldiers lying about after the battle was over. But what shocked him even more was how little was being done for those individuals. Using his own money he arranged for food and medical supplies, recruited and organized local volunteers, and began to tend to those who could be saved. It was a herculean effort, and one the like of which the world had never seen before. After the conflict was over, he wrote a short book entitled, Un Souvenir de Solférino [A Memory of Solferino], and paid to have 1900 copies printed. The book had three main sections. The first was an account of the battle itself. The second detailed the battlefield after the fighting - its "chaotic disorder, despair unspeakable, and misery of every kind" and tells the story of caring for the wounded in the small town of Castiglione. The third was a plan; a plan to have the nations of the world form societies, co-ordinating the efforts of trained volunteers to provide care for the victims of war until they recovered. He spent the next two years traveling, at his own expense, to distribute the book to national and civic leaders all over Europe and promote his plan. In 1863, the Geneva Society for Public Welfare, appointed a committee of five, including Dunant, to examine the practicalities of implementing the plan. Despite numerous conflicts, and attempts by some to derail Dunant and expel him from the committee, they did manage to create the International Committee for Relief to the Wounded. One year later, on August 22, 1864, again despite the efforts of some to keep Dunant out of the process, twelve nations signed an international treaty, commonly known as the Geneva Convention, agreeing among other things, to guarantee during an armed conflict, neutrality to medical and relief personnel, to expedite supplies for their use, and to adopt a special identifying emblem - in virtually all instances a red cross on a field of white. The International Committee of the Red Cross (ICRC) was born. For a time Henri served as the organization's secretary, but with most of his energies and resources being directed to the cause, there was little of him or his resources left to run his company. The water rights he needed were never granted, his company was mismanaged by those he left in charge of it in Africa, and in 1867 he was forced to declare bankruptcy. The resulting scandal was too much for the board of directors in Geneva to handle, so he was also forced to resign not only as secretary but as a member of the society he had founded. Within a few years he was literally living at the level of the beggar. There were times, he says in a memoir, when he dined on a crust of bread, blackened his coat with ink, whitened his collar with chalk, and slept out of doors on benches in city parks. After that, Henri Dunant all but disappeared. Staying briefly in various places, living off the generosity of friends and a few wealthy individuals who respected his humanitarian efforts, he eventually found himself too ill to travel any further and was given space in a hospice in the small Swiss village of Heiden. There, in Room 12, he spent the remaining eighteen years of his life, too ill to leave. It was also there that a journalist, Georg Baumberger, twenty-five years after the scandal in Geneva, discovered Dunant was still alive and wrote an article about him which, within a few days, was reprinted in the press throughout Europe. Messages of sympathy reached Dunant from all over the world, and overnight, the scandal long forgotten, his fame was restored. "There is no man who more deserves this honour, for it was you, forty years ago, who set on foot the international organization for the relief of the wounded on the battlefield. Without you, the Red Cross, the supreme humanitarian achievement of the nineteenth century would probably have never been undertaken." Henri also received a number of other awards and accolades during those last few years, but he never spent any of the money on himself. He donated funds to make sure a "free bed" would always be available in the Heiden hospice for a poor citizen of the region and deeded some money to friends and charitable organizations in Norway and Switzerland. The remaining funds went to his creditors to partially pay the enormous debt left after his disastrous business venture. 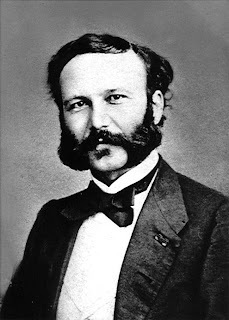 Henri Dunant, Christian humanitarian, who changed forever the way the world responds to those who have suffered as a result of war, died in his sleep on October 30, 1910 - 97 years ago this week. October 29, 1837: Dutch theologian and politician Abraham Kuyper is born in Rotterdam, Holland. He became so popular and famous that on October 29, 1907, the whole nation celebrated his 70th birthday, declaring, "the history of the Netherlands, in Church, in State, in Society, in Press, in School, and in the Sciences the last forty years, cannot be written without the mention of his name on almost every page." November 1, 1512: After four years of work, Michelangelo Buonarroti unveils his 5,800-square-foot painting on the ceiling of the Vatican's Sistine Chapel. November 2, 1533: Harried by Catholic authorities, John Calvin flees Paris by lowering himself out a window on a bedsheet rope. (Who knew anyone actually did this?) He then left town by disguising himself as a farmer, complete with a hoe over his shoulder. He spent three years as a fugitive before settling in Geneva. November 3, 753: Pirminius, the first Abbot of Reichenau (Germany) dies. His pastoral instruction book, Scarapsus, contains the earliest evidence for the present form of the Apostles' Creed. November 4, 1646: The Massachusetts Bay Colony makes it a capital offense to deny that the Bible is the Word of God.